Bled attracts visitors of all ages, interests and tastes. While many arrive in organised groups, increasingly large numbers come independently for a day, a weekend, a week and sometimes even longer. In 2017 there were 1 million overnight stays in this small town. Some people see Bled as a short stopover, just a few hours to visit to the castle, take a short voyage on a pletna to explore the Bled Island, perhaps do a circuit of the lake in a horse drawn carriage. Some only get a snapshot by arriving in coaches to spend a very short time. This guide is aimed at all and any of those people. Whether you spend an afternoon or a week in Bled, this book aims to help you find the best, the hidden and the most exciting aspects of the town whether that be food, drinks, activities, entertainment or sights. I mainly speak directly to the reader and assume you are – even in an organised group – “independent”; that is, you decide what you want to do and where you want to go, are happy to explore something new and don’t mind a few words of advice from people who have been before you and are now coming back. To that end, we travel together and independently. 2018 is the European Year of Cultural Heritage and Slovenia is anticipating a year of cultural tourism. Bled is an important part of the county’s heritage – the lake, the castle, the island, the pletna and even Bled cream cake. Many of the events held each year are part of the country’s and the region’s cultural heritage. As are the classical music of Festival Bled to the celebration of the accordion held at the beginning of May to the rowing and skiing events to the Taste Bled menus each summer and so many other occasions, big and small. when surrounded by this, the image of paradise. The importance of bee keeping and the influence of bees to all our environment is only just being understood. This part of Slovenia is the home of the Carniolan honeybee the second most common bee species in the world. 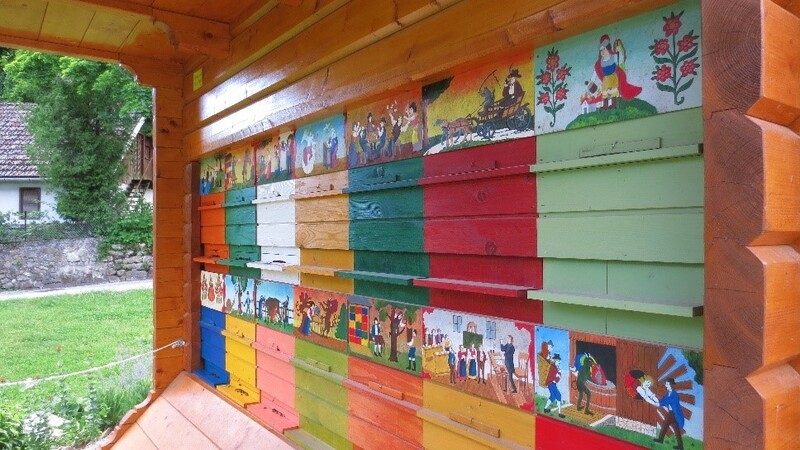 The Museum of Apiculture is in Radovljica, has a very impressive collection of historic painted beehive panels depicting images from the life at the foot of the Alps. Some are well over 100 years old. There are beehives in the shape of a giant man and a doll’s house. Radovljica with its tiny but beautiful old town is 10 minutes from Bled by bus. Throughout this book there are many examples of Slovenian culture; music, wine, food and festivals. Yet Slovenia’s most important cultural asset is the people. Almost always friendly – there are a few exceptions anywhere in the world – almost always interested in you, where you came from, that you think of Slovenia, excited (well, usually amused) if you try to speak Slovenian. 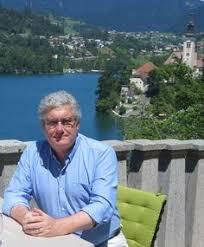 Slovenes especially people in Carniola are cultured, they enjoy the outdoors, they are very family focused. If you engage with them, they usually will engage with you. When that happens you really enjoy the country.